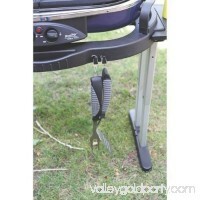 The Portable Coleman Sport Roadtrip Propane Grill has a wheeled stand that makes it easy to move and position. The lift and lock system also allows you to secur.. This Camp Chef Flame Tamer is the perfect aid for improved heat control. Tired of hot spots on your grill? This 10-inch solid steel disk is great for spreading ..
Gas Range Protectors, TSV Stove Protectors Stove Burner Covers, Stove Liner Cook Top Hob Liners, Reusable, Dishwasher Safe, Easy To Clean, Non-Stick for Kitchen.. Features: Measures 27.9 by 4.9 by 14.8 inches (W x H x D)Piezo-electric ignition that eliminates the use for lighter/matches per burnerTwin stainless steel gas .. The original Camp Stove Toaster performs perfectly, toasting up to four slices at a time. Durable steel construction with coated wires fold flat for easy packin.. The King Kooker CS29 25-Inch Two-Burner Outdoor Cook Stove makes an ideal accompaniment for outdoor parties, picnics, and camping trips. The interlocking legs c..
Accommodating newer gas stoves with higher burner grates, these extra deep burner covers turn your stovetop into a smooth countertop, hiding spills and splatter.. Camping has never been easier! 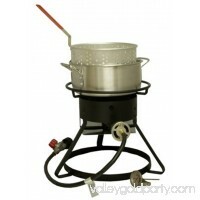 This compact King Kooker 22" Portable Propane Outdoor Cooker Package is great for all outdoor excursions. 54,000 BTU burnerDeep f..
12 stove liners in two sizes6 large, size: 8.25" diameter and 6 small --size: 6.25" diameterMaterial: aluminumDisposableSave time - makes cleaning your stove ea.. Durable heavy-gauge steel frame with baked-on enamel finishDetachable lid allows for oversize pots, pans and griddlesIndividual burner control knobsdetailedDes.. 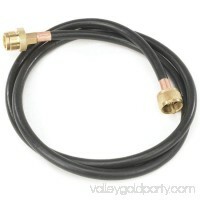 The Stansport 10' Hose - Connects Appliance Hose comes in handy during your camping or hiking trips. This distribution post propane hose easily connects your ap..
Show off your grilling skills on camping trips, picnics, and at tailgating parties with the Coleman RoadTrip LX Propane Grill. Two individually adjustable dual .. This 60,000 BTU Camp Chef Single Burner Stove is made to heat things quickly. This Outdoor Burner Stove has a 60,000 BTU/hr output. The 60,000 BTU Camp Chef Sin.. When you pack the propane powered Coleman PerfectFlow Grill Stove you can sautee veggies while youre grilling up chicken or get the soup going while youre cooki..
Light durable cooking platform that is perfect for mess kits, backpacking, and emergency situationsDesigned for optimal air flowdetailedDescription":"Folding S..